............in late October, there was a touch of fog scattered here and there, then I heard this sound....What is that?, I asked myself....walking closer and closer to the sounds of the night...........I stepped a little closer, and then I saw in the clearing this creepy old house, shutters banging, .......an old dead tree, creaking in the wind....so many bats, flying and screeching as I ducked in fear....and standing right in front of me, old Mr. Bones! I screamed as loud as I could and ran right home!! Welcome to the Artistic Outpost Design Team August Hop! 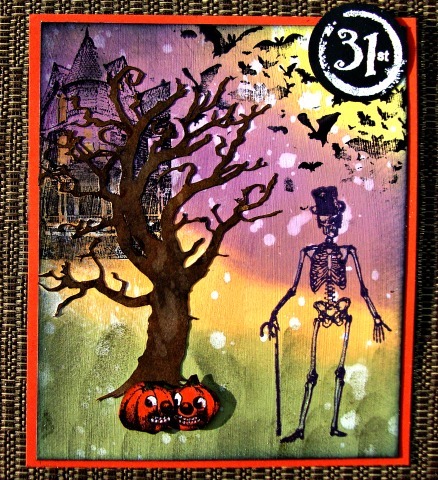 I recreated what I saw that night using the Gothic 31, Haunted Halloween and Vintage Halloween stamp sets. The background is done with Distress inks, and I added a great die cut spooky tree. Thanks, enjoy the hop today! Be sure to stop by the Designers Blogs for details on their projects! Very cool, Gerrie! Wonderful background - love the colors! Those Jack-o-lanterns look positively demonic. Wonderful make. Love it! Great scene and color!!! Makes me want candy!!! Love your creepy story and card! Fantastic composition the colors are spookily fantastic! No bones about it, I love this "dark and dreary" card! That background is so cool and that tree placement is perfect! Spook fun, GF! Spookingly colorful background! Just perfect for your dancing skeleton and die cut tree! Ooh, fabulously queasy colours in that wonderful background... the bats are just amazing!! Wonderful, wonderful card! I love Halloween - so much furn and a few treats! Love this card and all the different stamps used and the DI's. I love the various colors in your background. Your stamping placement is perfect. awesome card! Love the story and the colors and it's just fabulous! Great story and a fabulous interpretation, the background is out of this world, fantastic make Gerry, thanks for sharing..
Oh great now I'll probably not sleep tonight!! Loved the distress ink backgrounds and esp. your scary scene! I love the expressions on the little pumpkin faces. Are they sneaking a look at the handsome gentleman who is showing off his hat? This is spooky and awesome at the same time! LOL...love it!